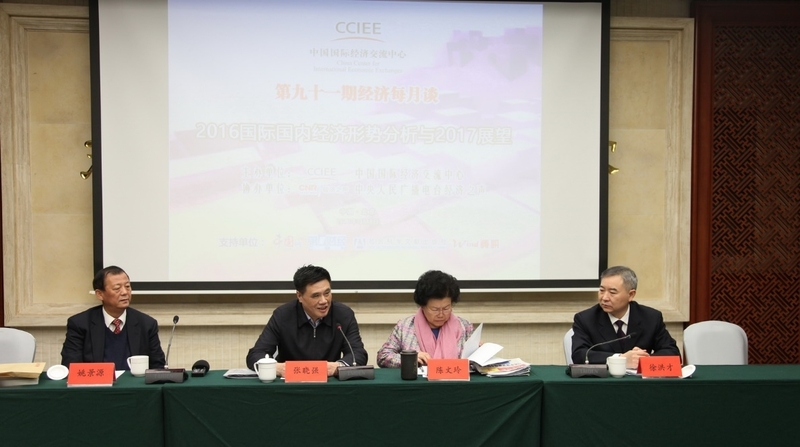 On 18 January 2017, CCIEE held the 91st Monthly Economic Talk under the theme of “Analysis of China and World Economy: 2016 and 2017”. Zhang Xiaoqiang, Executive Vice Chairman and CEO of CCIEE, presided over the talk. Mr. Yao Jingyuan, Special Research Fellow of the Counselors’ Office of the State Council, Ms. Chen Wenling, CCIEE Chief Economist and Deputy Director of the Executive Board of the Council, Mr. Xu Hongcai, Deputy Chief Economist of CCIEE, delivered their speeches respectively. In his speech, Yao Jingyuan analyzed China’s economy from four perspectives, economic growth, commodity prices, PPI (Producer Price Index) and enterprise profitability index, and the job market. He concluded that the economic achievement made in 2016 was hard-earned and the five major tasks in 2017 can be summarized as cut excessive industrial capacity, de-stocking, de-leveraging, lower corporate costs and improve weak links. In 2017, the economy will achieve stable progress. Therefore, we have to change our development concept, focus on supply-side structural reform, expand demand moderately and more importantly, we have to firmly promote reform. Chen Wenlin proposed that the current world economy may have experienced some obvious turning points. In 2017, the world economy is still filled with uncertainties, and contradictions. At the same time, China is still the major force driving world economic growth. China will play a more active role in global governance and promote global economic development. Xu Hongcai also believed that the economic achievement made last year was hard-won. Both the macro and micro data indicate that China’s macro economy has been slow but stable and the situation is getting better. In 2017, China’s economic growth rate might be lower than that of 2016 but the quality of growth will surely be better and the structure will be further optimized. Overall, the economy is on the up. In the Q&A section, experts answered various questions from media and the audience. Researchers from CCIEE, representatives from enterprises, research institutions and news agencies took part in the event.